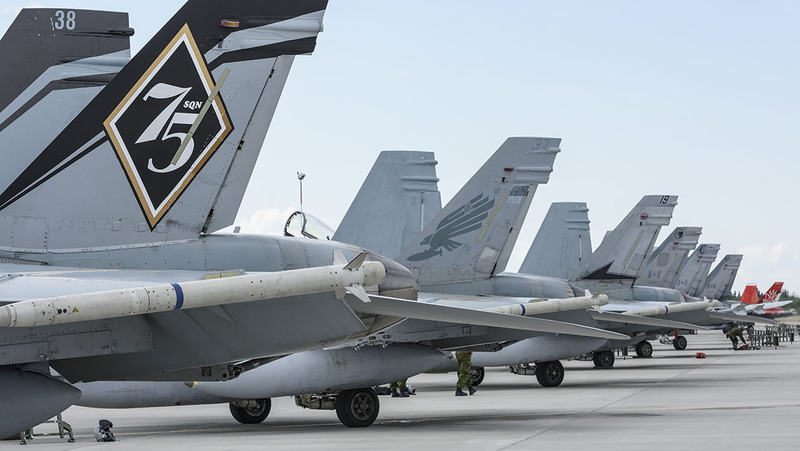 Canada’s Auditor General has criticised a plan to acquire between 18 and 25 second-hand RAAF F/A-18A/B Hornets for the Royal Canadian Air Force (RCAF) from 2019. Auditor General Michael Ferguson found in a report that Canada lacks the pilots and maintenance personnel to support and operate Canada’s existing fleet of about 80 CF-18s, let alone extra aircraft. Canada requested the aircraft after it paused its planned F-35A acquisition in 2014 and then cancelled an interim buy of 18 Boeing F/A-18E/F Super Hornets in 2017. The retiring RAAF aircraft are only a few years younger than Canada’s CF-18s, and in the past decade and a half they have been upgraded to a similar standard. The combined fleet is expected to serve until a replacement enters service around 2030, making the youngest CF-18 or F/A-18A/B more than 50 years old by then. “The government is now planning to buy used fighter aircraft from Australia that are the same age and have the same operational limitations as the CF-18s that the Royal Canadian Air Force are currently flying,” the report notes. The report stressed the capability risks of continuing to operate an ageing fighter type. “Flying the CF-18 until 2032 without a plan to upgrade combat capability will result in less important roles for the fighter force and will pose a risk to Canada’s ability to contribute to NORAD and NATO operations,” the report says. Canadian Defence Minister Harjit Sajjan said recently the RCAF was looking at what further upgrades could be made to the CF-18 fleet including new weapons and self-defence systems, and that the former RAAF aircraft would be further upgraded. Canada is also conducting a competitive evaluation of several aircraft types to ultimately replace its CF-18s, the youngest of which was built in 1988. The new aircraft it is evaluating include the F-35, the F/A-18E/F, the Saab JAS-39E/F Gripen, and the Eurofighter. Dassault recently withdrew its Rafale from the competition after deciding it couldn’t meet Canada’s industry offset requirements. Perhaps the Canadian Auditor General should be more closely scrutinising Canadian defence planning and procurement so they wouldn’t have to buy near 40 year old 2nd hand machines. This is what happens when socialist govt come to power, the first budget they slash is defence, that money is then spent on social engineering. Canadian Defence procurement is probably the worst in the world, an absolute basket case. Their new AOR project is the perfect example, chose the German Berlin Class in 2013, a couple of years before Australia chose our new Spanish Ships, no work has been done on the Berlin class at all, Australia’s first Ship is in the Water! Canada actually ordered Shornets off Boeing than there was a huge legal stoush between Boeing and the Canadian Government over Subsidies for Bombardier and the sale fell through. What a joke is Canadian defence procurement! Quit mucking around, wasting money in the interim, and just acquire the aircraft that the RCAF should be buying, was going to buy, and will eventually end up buying anyway after all of this is said and done – the F-35, the only real contender for a modern (5th generation) air combat force. Stop complaining about the cost of the F-35 (which is actually now great value for money and will be around US$80m-$85m for the A variant when Canada orders), put the $3b towards your fleet of 88 F-35s, and cease gambling with Canada’s defence, NATO and NORAD obligations. The F-35 article notes how our first two Hornets arrived in Australia in 1985. I remember this event well – they also flew over Perth and I saw this. How old were these aircraft at that time? Is the Canadian Auditor General saying the youngest of CF and Australian aircraft will be 50 in 2030? The last Australian Hornets were delivered in 1990, so I think there is maths problem here.